Painting of a landscape with mountains in the early morning. Yellow and blue are wonderful colors, which together form a beautiful contrast, a complementary color contrast. In nature, blue is much less common than yellow (at least with flowers), but the combination can be seen more often in the sky when the sun rises. 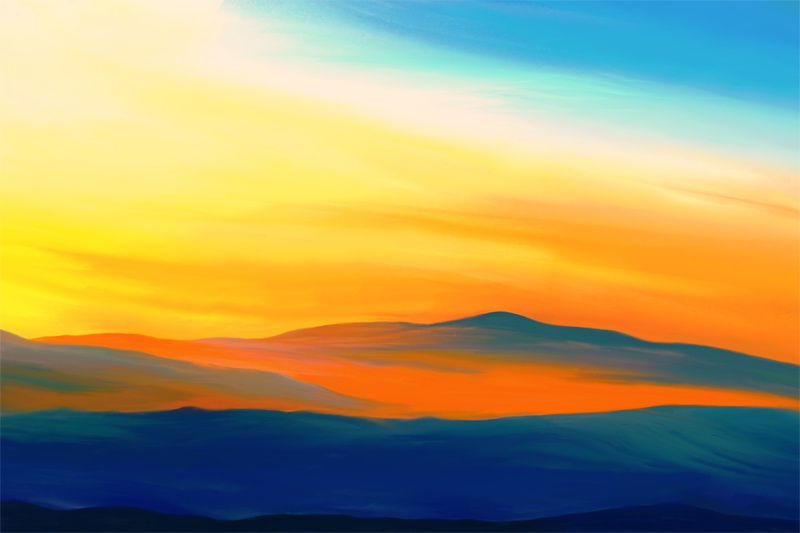 The mountain landscape is made with ArtRage. Again, I mainly used the palette knife tool and a bit the soft pastel tool. For the surface, I opted for smooth “paper” with little to no structure, so that the colors merge more smoothly. The painting is available via Etsy in three different sizes as fine art giclée/poster print. But on RedBubble it can be ordered in more sizes and on more materials/merchandise, such as canvas, smartphone cases, pillow cases and greeting cards.